On Wednesday, I volunteered as a Parent on the Playground at my daughters’ school (which essentially amounts to being a referee for ninety minutes). 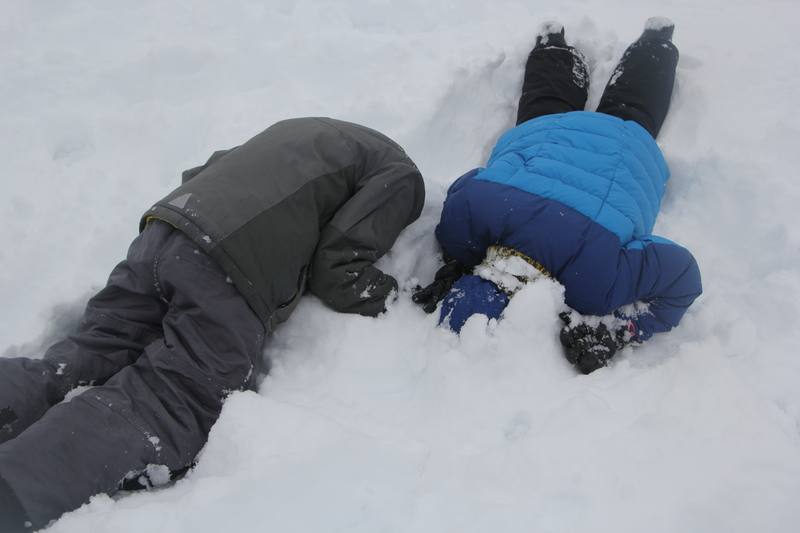 There was snow up to my knees as far as the eye could see and the students had been prohibited from actually using the playground equipment (too slippery to navigate in bulky snow gear) or throwing snowballs (a byproduct of today’s Safety First! approach to childhood), but that didn’t stop the kids from racing around like maniacs, trudging through snow as deep as their thighs, building forts and snow piles, gleefully throwing themselves to the ground both forward and backward (because neither hurts when there’s enough snow to cushion the blow), burying their friends up to their chins in fluffy white goodness, and challenging one another to see how far they could plunge their heads downward before succumbing to the cold. To be sure, these are the types of games that all children would play if sent out for recess when there’s a crap-ton of snow on the ground; these kiddos are not unique in this respect. But, as I watched them traverse the snowbanks, tug their mittens on and off, and zip in and out of their snow gear quickly enough that no class was late for recess or lunch, it occurred to me that these youngsters don’t treat playing in the snow as a novelty; no, they are experts at it. Living in Western New York, we are part of region that annually sees the most snow of any metropolitan area in the nation. Add to that the fact that we also experience a great deal of lake effect snow (that same stuff that drowned Buffalo in up to SEVEN FEET of snow in November) and, well… we know snow. Admittedly, we rarely get dumped on the way that Boston and the northeast have recently – our snow typically comes bit by bit and adds up over time – but still, we are super tight with Old Man Winter. Nick and I have lived in Denver, which certainly sees its share of snow, and Nick grew up in Minnesota, which is known for its winters – so we are not strangers to frozen precipitation. But, after being completely flummoxed throughout most of our first couple of winters in Rochester seven years ago (It’s snowing!! It’s snowing!! OMG it’s snowing! Will you be able to get to work? How much will we get? Why are the forecasters so nonchalant? Why is nobody panicking? Why does no one care? People! It’s snowing! ), I’ve come to learn that life in a snow belt is just a little different from other places. Snow is a way of being, woven into our culture in ways that just don’t happen when you get snow here and there (even in large amounts) rather than almost daily (24 out of 31 days in January alone). 1) It’s considered an annual romantic gesture every Thanksgiving weekend when your spouse makes sure you’ve got an ice scraper/snow brush in the car. 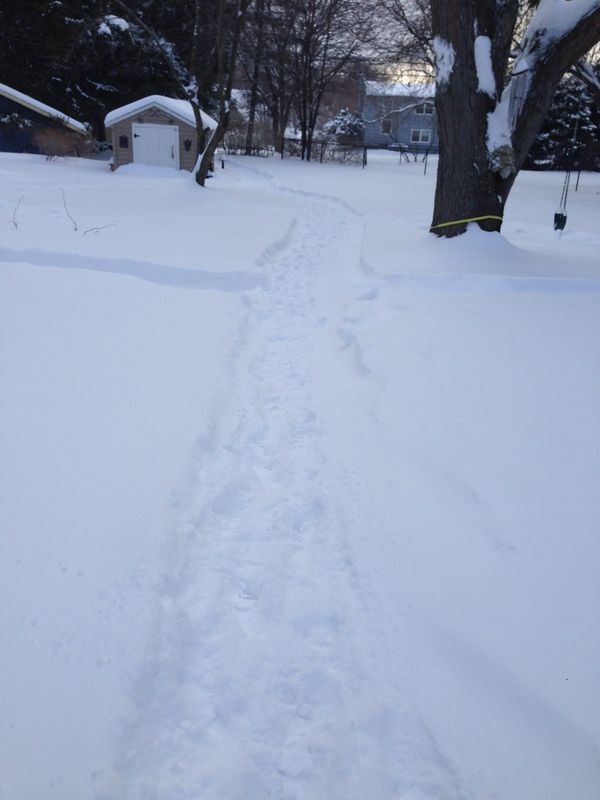 5) Your neighbors use their snowblower to create a path for your kids to use so that they can more easily walk to school. 6) You have an opinion on salting versus sanding and a well-honed, definitive shoveling strategy; you will silently eye neighbors who approach their driveways and sidewalks differently than you. 7) You receive a reminder from your child’s elementary school that appropriate snow gear is necessary every day because, unless the temperature is below 13*F, it’s raining, or the wind chill makes it feel like -10, the students will have outdoor recess. 8) You have mastered the art of smooshing snow onto your car’s headlights, license plates, and rear window as a way of wiping off the perma-salt. 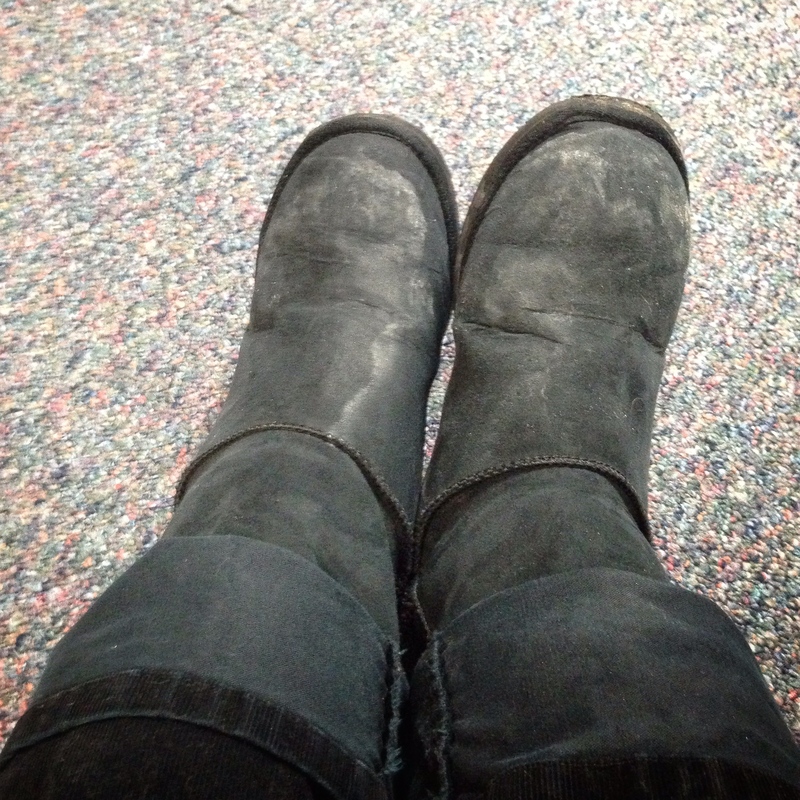 11) You give up fighting the chalky white salt stains that decorate your shoes and jackets. 13) You carefully construct your child’s Halloween costume to make sure that heavy layers can go under it… or you simply assume that it will be completely covered by a coat and maybe snow boots. 17) Even pre-schoolers know one of the most important questions to ask about a snowfall: Is it packing snow or not?? 19) You can sleep in a little bit later from December through March because your morning routine has shortened; why bother fixing your hair when it will just be wet/ icy/ flattened by a hat/ covered with a hood, anyway? 20) Except you can’t actually sleep later. Because shoveling. Because of course your employer will expect you to arrive on time and the school buses will be running on schedule, regardless of the five new inches of new snow on the ground. 21) You can take a break from any kind of yard care, however, because you won’t see the ground for at least four months. The dog can’t find his ball, either, but that doesn’t stop him from plunging his head into the snow as though he is looking for it beneath the surface of a pond. 22) As soon as the temperatures hit 40*F, virtually every child in the neighborhood can be seen playing outside… in short sleeves. 23) There’s never a run on bread and milk before a storm because no one’s terribly worried that they’ll get snowed in. 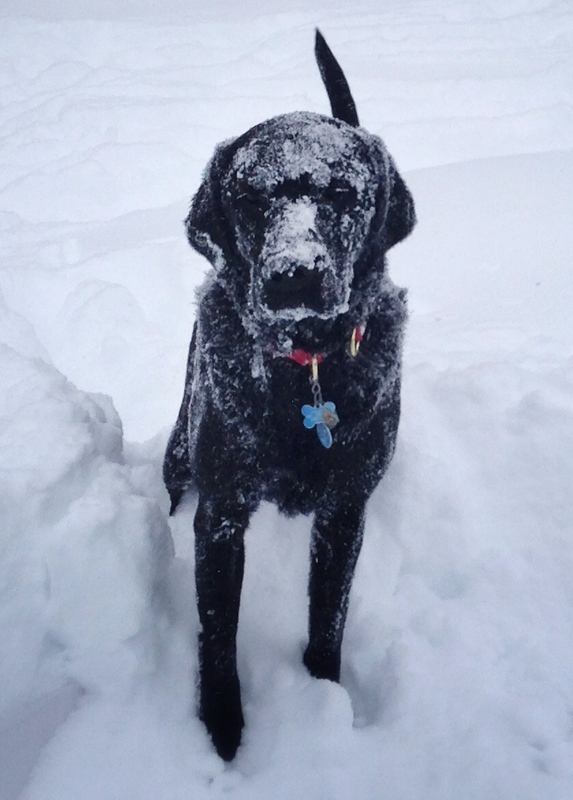 25) You think of wading through snow up to your knees on playground duty as your exercise for the day. 27) You appreciate spring and summer more than anyone else, anywhere, ever. Don’t get me wrong – I love living here, even with its snow insanity. I’m also not trying to diss other wintery areas where people know cold (hi, Twin Cities!). But there’s no denying that living in a super-snowy place has its own… peculiarities. With that said, if we do manage to have another snow day on Monday and my girls miss five consecutive school Mondays, “peculiarities” may not be the word I’ll choose… But for today, come on over! The snow is fine! * taken almost word-for-word off Facebook from my friends HWK, MGD, PCS, MK, SRW, AML, SLR, CB, and MLM, respectively. Thanks, all! This entry was posted in good life, thinking and talking, typical crazy and tagged family, parenthood, Rochester, snow, snow belt, winter, WNY by missemtoo. Bookmark the permalink.